Paul Muni, Claude Rains, Erskine Sanford. 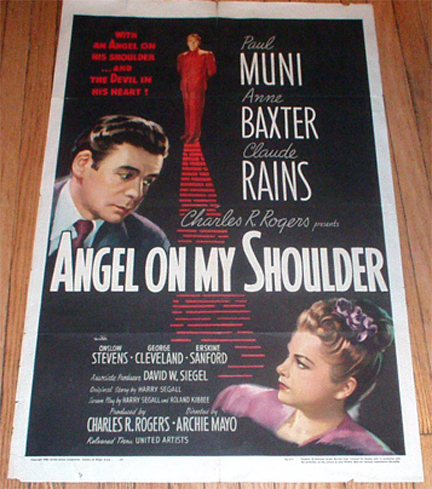 Angel On My Shoulder was written by Harry Segall, the author of Here Comes Mr Jordan. In fact, it is very reminiscent of that film as well as many others about the Devil, angels and people being given another chance. Prominent in the '40s were films like Heaven Can Wait, Alias Nick Beale. (Here Comes Mr Jordan was remade by Warren Beatty as Heaven Can Wait; Angel On My Shoulder was remade in the 1980s with Peter Strauss, Barbara Hershey, Richard Kiley). This film was directed by veteran Archie Mayo. It lacks polish, but is quite vigorous. Paul Muni does a reprise of his Scarface gangster style as the Mr6 Claude Rains is his smooth, suave self, enjoying puns about hell as well as smooth and evil insinuating talk as the Devil. Anne Baxter is the attractive heroine. The film seems somewhat quaint - although the '80s saw a revival in this kind of redemption and salvation story beyond this world. 1. A pleasing fantasy of the 1940s, in the tradition of this genre of the time? The clash between good and evil, religion, redemption and salvation? 2. '40s style, black and white photography, studios, special effects for Hell? The stars? The dramatic score? 3. The '40s and the themes, the stories by Harry Segall? Symbols? Evocation of the period, American society and values? 4. The initial quotation about living life to the full? Eddie, in jail, tough, getting out, the confrontation with Smiley, his death? 5. Eddie dying, the visuals of Hell, the workers, the furnaces, the souls in search of their place, no traces of bullets and ropes? The Devil's office? 6. Eddie and his reaction, anger? meeting Nick, their bargain? Through the heat, the long lift-ride into the city? Walking the city, having no bodies, the effect, going to the meeting? Nick's plan? The judge and Nick's dislike of him, wanting him to lose the election and not effect any reform? 7. The judge in court, the collapse, asleep, Eddie's takeover of his body? Eddie waking up, his reaction to the valet, telling him to scram? Being rough, puzzling everyone, going to St. Louis? Nick on the plane, plane trouble? Barbara, calling her 'Rosie'? Everybody treating him with caution? Going to make the speech, Nick rousing up his anger? The hecklers, his punching them and becoming a hero? The case, meeting Rosie, willing to take the bribe but reacting against it, the rejection? Nick angry with him? Eddie beginning to change, the relationship with Barbara? The effect of drinking and smoking? Going to the building site, the possibilities? Telling his life story, his lack of opportunity, drunken parents? His wanting to kill Smiley? His talk with Barbara, her fears, having him arrested for taking the car? In jail, talking to Nick and himself? Barbara disowning him, then wanting to marry him? The clergyman and his sermon? His realisation who Nick was? Confronting him? The bargain that he would go back to Hell if Nick would leave the judge alone? Nick's agreement? His going to farewell Barbara? His promise of better things? His good deed done - going back to Hell, forcing Nick to make him a trustee? 9. Barbara as attractive, the secretary, engaged, ambitious? Trying to deal with Eddie? The speech, the building site, the car, disowning him, the wedding and her exasperation? her sympathy for him? The future with the judge? 10. The valet, his bewilderment? Matthew as the psychiatrist, giving advice? 11. Smiley, his killing of Eddie, his crooked connections, the political gangsters, coming to the judge's office, his talking about his success, talking about Eddie, Eddie leading him-con, Nick persuading Eddie to shoot him, Smiley backing and falling out the window? 12. The American experience, the poor home life to the young man becoming a gangster, no hopes? A chance on Earth, realising the limitations of his life, transformed and doing a good deed?